MUNICH, April 10, 2019 /PRNewswire/ -- Zoomlion Heavy Industry Science & Technology Co., Ltd. (Zoomlion) has impressed at bauma 2019 with an array of efficient, reliable and intelligent 4.0 generation crane products that emphasize environmentally-friendly technologies and industry-leading Intelligent Manufacturing (IM) and design standards. The centerpieces of Zoomlion's crane products display at bauma 2019 are the ZCC1300 crawler crane and ZRT850 rough terrain crane. Both models have been praised for their guaranteed safety features, intelligent control and management system, and reasonable price. "We hope to present our strongest crane products at bauma 2019. They showcase Zoomlion's exceptional research and development capabilities as well as continuous innovation to push the industry's development. Our goal is to always create better and more intelligent products for our clients worldwide," noted the Crane product manager of Zoomlion. As the earliest Chinese high-end equipment manufacturer with the capability to develop and produce truck bodies, chassis and crawler cranes, Zoomlion has engineered a comprehensive product portfolio of truck cranes, crawler cranes, all-terrain cranes, rough terrain cranes and lorry cranes, all widely applied in infrastructure, high-speed railways, harbors, oil field constructions and more. Zoomlion's ZCC1300 crawler crane has been highly anticipated at bauma 2019 as a new generation medium tonnage 4.0 model integrating IM, intelligent control and information interconnection, and meeting the EU's EN13000 standard. The crane's alerts, fault messages, cumulative work statistics, positioning and orientation can be managed conveniently on Zoomlion's mobile application. The ZRT850 rough terrain crane is designed for oil field projects with strong functions, robust power and excellent maneuverability. The model is equipped with an advanced field bus control system and safety alert mechanism to ensure operational safety and efficiency, as well as a heavy duty chassis that supports multiple steering modes adaptable to different terrain conditions. The ZRT850 passed the ANSI certification in North America, the CE certification of the EU and EAC certification of CU-TR. Meanwhile, Zoomlion's building hoisting machineries also lead with the highest market share of global tower crane market. At bauma 2019, Zoomlion is debuting T7020-12H, a 4.0 flat head tower crane customized for the European market. Developed by Zoomlion's international team of engineers and technicians according to client specifications, it's an advanced edition of Zoomlion's 2015 Precast Concrete (PC) flagship tower crane T7020. 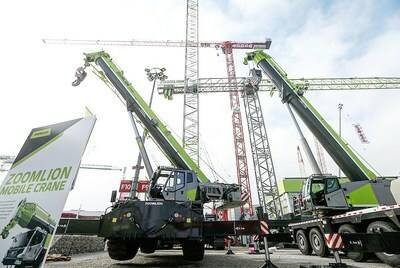 Zoomlion Willbert, the German company with No.1 market share in Europe's high-end crane market, is showcasing its latest flat head tower crane WT260 at bauma 2019, which excels in hoisting capability, precision and safety features. Founded in 1992, Zoomlion Heavy Industry Science & Technology Co., Ltd. (Zoomlion) is a high-end equipment manufacturing enterprise that integrates engineering machinery, agricultural machinery and financial services. The company sells nearly 460 cutting-edge products from 55 product lines covering ten major categories. For more information, please visit http://en.zoomlion.com/.